This segment offers Nazca-related links and books. BBC Online: The Lost City of Nasca - transcript from the program, discussing the Nasca Lines and the Nasca city, Cahuachi. Mystery of the Nazca Lines, The - takes a look at how the ideas and values of the present color and distort our understanding of the past. Mystic Places: Nazca Lines - series of three articles discussing what they are, how they were made, and for what purpose. 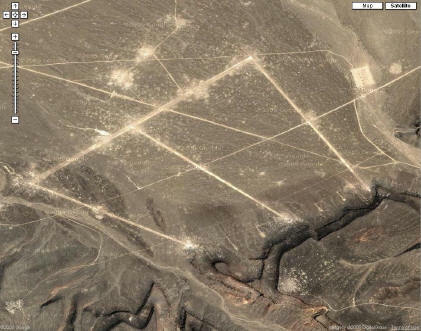 Nasca Lines - consisting of over 300 images, etched into the surface of the desert pampa sand, made of straight lines, geometric shapes, and pictures of animals and birds. Nazca - provides an overview of the different stages of their culture based on their pottery and famous geoglyphs. 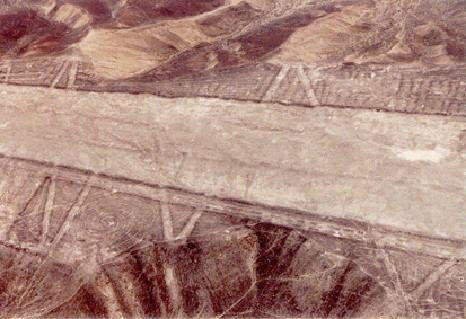 Nazca Lines, The - presents the several theories about the significance and intention behind the creation of the lines. 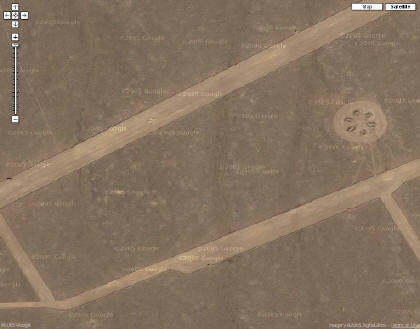 Skeptic's Dictionary: Nazca lines - dispelling alien runway "theories". Survive 2012: Nazca Lines - offers diagrams and maps of the lines and figures etched into the plain between the Inca and Nazca valleys. Minnesota State University - E-museum - a general view of the pre-Columbian Andean cultures. http://www.humanrevelations.com/sfinx.htm G.J. de Jong demonstrates that the Incas penetrated to the Four Corners of the Earth, brought this knowledge back to their country of origin, the area now covered by Peru and Bolivia, and that they set up their temples on the Path of the Sun. About 20 theories are current amongst scientists and pseudo-scientists but even today nobody is able to provide a comprehensive and scientifically provable answer to this question. One of the major theories deals with astronomical phenomena. In order to prove this astronomical theory a special research project was started by the department of surveying and cartography of the University of Applied Sciences in Dresden, Germany. The initial steps were the development of a special datamodel and the creation of a regional Digital Terrain Model (DTM). In September 2000 the photogrammetric data processing of the Nasca block (about 150 images) was started. This includes aerial triangulation, local DTM- generation, the extraction of lines and geoglyphs and the generation of ortho-images. Parallel to that the development of an astronomical approach was started. The presentation includes theoretical as well as practical aspects. We report about the current stage of the project. Especially, the datamodel and the astronomical concept will be explained in detail. In the practical part we will demonstrate some analyses and special animations using our GIS. Remarks: A quite similar article was presented at the International Workshop on Recreating the Past ~ Visualization and Animation of Cultural Heritage ~ in Ayutthaya, Thailand, 26 February- 1 March 2001. This workshop was organized by ISPRS Com. V.
The geoglyphs of Nasca, Peru are considered one of the world’s major mysteries. Despite the fact that many efforts have been made in the past 70 years to record and analyze the geoglyphs no convincing explanation has emerged yet which would explain the purpose of these drawings in the sand beyond any doubt. Many hypotheses have been put forward and each author will find a certain number of lines and figures in support of his/her opinion. The huge number of lines, trapezoids, star centers, biomorphical figures, etc. has up to now defied any comprehensive recording and analysis. We are currently conducting an ambitious project which aims at the complete 3-D recording of the geoglyphs of the areas of Nasca, Palpa and San Ignacio (a total of about 300 km2) with photogrammetric means. This is done in cooperation with a group of archeologists who will try to relate their excavation results to the geoglyphs in order to get a more complete picture of the overall cultural and social background of the Nasca people (200 B.C. - 600 A.D.). We are using the latest digital photogrammetric technology for the recording of the geoglyphs and some of the most advanced visualization software. Finally, all data will be integrated on a GIS platform, which will require the efficient management of both vector- and extensive raster image data. One of the final aims is to make the vector data available to the international community of scientists who show a serious interest in contributing towards the solution of the Nasca mystery. In this process we have produced over 1000 aerial photographs at scales 1:5 000 and 1:10 000 both in color and B/W. In addition we have collected existing, older photographs which can give us an indication of the damage that has been done to the geoglyphs in recent years. At present the block Palpa has been fully processed and visualization results have been shown to the public on a SGI Onyx2 in an interactive mode at the Nasca exhibition in the Rietberg Museum, Zürich and in the VisDome of ETH Zürich as stereo projection on a large 4x12 m2 screen. We report here about the current stage of the project. 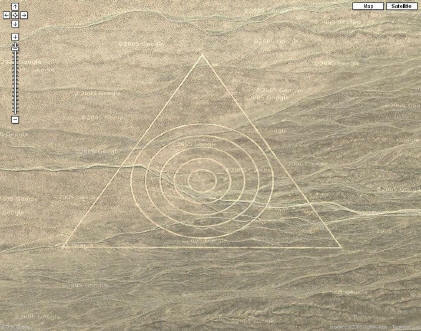 Compare Nazca lines with Area 51desert "drawings"